Please note that Statutory Assessment were replaced by Education, Health and Care (EHC) needs assessments from September 2014. This page refers to assessments conducted before then. An assessment of this child has been carried out during the six months prior. It believes after assessing the evidence that a statutory assessment is not necessary. The local authorities will only carry out an assessment if it is a probability that the child has special educational needs and needs to be assessed to find out what provisions need to be taken to meet those needs. The child is not between the ages of two and nineteen, or older than sixteen but not in education. A local authority is the only body which can carry out a statutory assessment. "WHO CAN REQUEST A STATUTORY ASSESSMENT?" A parent, teacher or professional (such as an educational psychologist) working with the child can request a statutory assessment for him or her. If the child is over the age of two, the local authorities do not need the consent of the parents to carry out an assessment. "WHAT HAPPENS AFTER YOU HAVE REQUESTED A STATUTORY ASSESSMENT?" Confirm that they are considering your application of a statutory assessment. Tell you how long it will take (it should not take longer than six months). Give you the name of the person at the local authority who will be your point of contact - your named officer. Request that you give written or spoken reasons, called evidence, about why you think your child should (or should not be assessed). This has to be done within 29 days. Ask if there is anyone else you would particularly like the local authority to talk to about your child. Ask you for any evidence or opinions you have collected or intend to get. Evidence that your child's school has taken note of the requirements of the national curriculum and responded appropriately. Evidence provided by your child's school, by you and by any other professionals who have been involved with your child, about the nature, extent and cause of their learning difficulties. Evidence of the rate of your child's progress and other features of note to do with how your child has progressed. Evidence that where some progress has been made it has only been as the result of a lot of additional effort. Evidence of social interaction or communication difficulties, restricted imagination and having a limited interest in certain activities or topics. Evidence of significant emotional or behavioural difficulties. "WHAT HAPPENS IF A REQUEST FOR A STATUTORY ASSESSMENT IS REFUSED?" 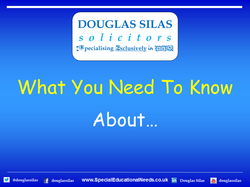 If either you or your child’s school has made a request for a statutory assessment and it has been refused by the local authorities, you are entitled to appeal to a Special Educational Needs and Disability Tribunal (SEND) in England or Special Educational Needs and Disability Tribunal Wales (SENTW). However, if the request was made independently of both you and the school (for example by an educational psychologist) you do not have the right to appeal. Therefore it is recommended that you make your own request for an assessment at the same time as anyone else does. "WHAT HAPPENS ONCE A REQUEST FOR A STATUTORY ASSESSMENT HAS BEEN ACCEPTED?" Have the right to be present at any interview, medical or any other test during the statutory assessment process. Can suggest any other people or organisations whose views may be helpful to the assessment of your child. May send the local authority any private advice or opinions you have collected. The local authority should take these into account. The statutory assessment takes 10 weeks, after which the local authorities will decide whether to issue a statement of special educational needs. If they decided that they will, it should be done within two weeks. If they don’t you are entitled to appeal to a Special Educational Needs and Disability Tribunal (SEND) in England or Special Educational Needs and Disability Tribunal Wales (SENTW). "DO YOU HAVE ANY EXTRA ADVICE ABOUT STATUTORY ASSESSMENTS?" Before making a request, you should discuss your concerns with the school's special educational needs co-ordinator (SENCO), or the manager of the nursery or pre-school. If they're unable to offer any further support and your concerns remain, you can make a request for a statutory assessment directly to the local authority. Clearly set out the reasons for making the request and provide information about the help that your child has already received. The request should be made in writing to the either the Director of Education, or Director of Children's Services of the local authority where your child lives. Send a copy of the letter to the school or early years setting. If you're thinking of requesting a statutory assessment for your son or daughter, you may like to use or adapt the following sample letter. Even if the school is asking for a statutory assessment it can be a good idea for you to send your own letter making a request for assessment, too. This then means that you can be sure of the exact date that the request was made; that it is a statutory assessment that has been requested; and that your legal rights are not compromised in any way. If a professional associated with your child's school, such as an educational psychologist, is the person making the request for a statutory assessment, it is especially important that you also make your own request (see the special note in the section 'The decision to assess or not').